Australia has participated officially in every Summer Paralympics Games since its inauguration in 1960 and in the Winter Paralympics Games since 1980. The Paralympic Games are held every four years, following the Olympic Games and are governed by the International Paralympic Committee (IPC). 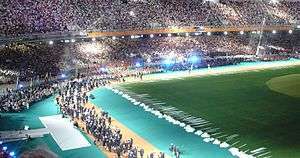 The Paralympic Games have been contractually tied to the Olympic Games since 2001, however, they have taken place at the same venues since the 1988 Seoul Summer Games and the 1992 Albertville Winter Games. In order to compete at the Paralympics, athletes must have an eligible impairment that leads to a permanent activity limitation, and athletes will compete in the classification appropriate to their impairment. These impairments are physical, vision and intellectual impairments. The Australian Paralympic Committee, established in 1990, is responsible for selecting and preparing the Australian Paralympic Teams for both the Summer and Winter Paralympic Games. This committee assists with funding the athletes and competition in addition to talent identification. Many of Australia’s gold medals have come from Athletics, a sport which has been popular amongst Australian Paralympic athletes, such as Tim Sullivan and Louise Sauvage. The other sport from which many medals have come is Swimming. 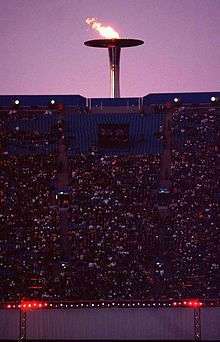 Paralympic Flame alight in Sydney at the 2000 Summer Paralympic Games. Australia has hosted the Paralympic Games on one occasion in 2000. Sydney, the capital city of New South Wales hosted the Summer Paralympics from 23 to 31 October 2000. There were 3879 participants from 123 countries across 19 sports and 550 events. Australia was the country to win the most medals with 149 medals overall. Daphne Ceeney and Elizabeth Edmondson shake hands after Edmondson won gold and Ceeney silver in the 50 m prone swimming event in Tokyo at the 1964 Summer Paralympic Games. 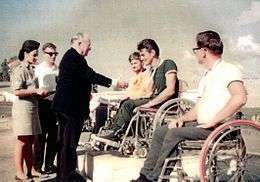 Tony South receives his gold medal for the archery Albion Round in Tel-Aviv at the 1968 Summer Paralympics from the founder of the Paralympic movement, Ludwig Guttmann. In Paralympic sport, Australia has been most successful in Athletics. Greg Smith gives the crowd a "thumbs up" after winning gold at the 800 m T52 final at the 2000 Summer Paralympic Games, in Sydney on Day 04. Since Australia began competing in the Winter Paralympic Games in 1980, it has only sent competitors in Alpine Skiing and hence all medals won at the Winter Paralympics are in Alpine Skiing. Australian team in Singapore en route to Rome for the 1960 Summer Paralympics. Athlete, Daphne Hilton (Ceeney) was Australia’s first ever swimmer who competed at the Rome 1960 Games. This games were the only Paralympic Games in which Australia did not win a gold medal in athletics. With the games in Tokyo, Australia was able to send a large contingent of athletes as a result of the shorter than typical journey. Australia placed fourth with a total of 31 overall medals; 12 gold medals, 10 silver medals and 9 bronze medals. Australia placed fourth again, with 38 overall medals; 15 gold, 16 silver and 7 bronze. Lorraine Dodd was an outstanding athlete at these games, setting three Swimming records for her class, all on the same day. Australian won 25 medals - 6 gold, 9 silver and 10 bronze medals in six sports. Australia finished 11th on the gold medal table and 9th on the total medal table. Elizabeth "Libby" Kosmala competed in her first Paralympics, and won a bronze medal in swimming in the Women's 3x50 m Medley Relay 2–4 event, and participated in other swimming and athletics events. The Olympic and Paralympic Games both aim to be apolitical; despite this, at the 1976 Paralympic Games, politics intruded into the games. Apartheid practices in South Africa brought controversy with the country’s invitation to and inclusion in the games. Australian athlete, Eric Russell took a stance against politics at the Paralympic Games when he refused his gold medal in the class 3 discus event as a protest. He later accepted the medal from Dr Guttman after a press conference, explaining his position. For the first time, television coverage of the Paralympics was broadcast daily to more than 600,000 viewers around the world. This Paralympic Games were the first Winter Paralympic Games. Australia was represented by one athlete, Ron Finneran; however, he was disqualified as his disability did not meet event classifications. 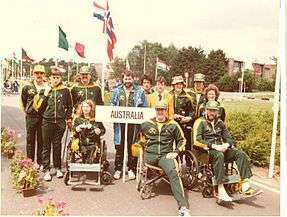 The Australian Team at the 1980 Summer Paralympic Games, in The Netherlands. This is the first Winter Paralympics that Australia competed in, but did not medal. Australia had two competitors, Kyrra Grunnsund and Peter Rickards, who participated in Slalom and Middle Distance Alpine Skiing respectively. 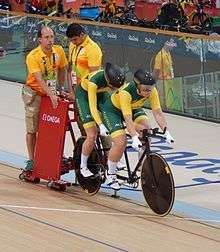 It was the 6th Summer Paralympic game in which Australia competed. Australia won 55 medals – 12 gold, 21 silver and 22 bronze medals. Australia competed in 10 sports and won medals in 6 sports. It finished 14th on the gold medal table and 9th on the total medal table. Australia did not win a medal, but was strongly represented by Rodney Mills in cross-country and Kyrra Grunnsund and Andrew Temple in the alpine events of slalom, giant slalom and downhill. The Australian amputee team at the 1984 New York Paralympic Games. In 1984, Australia more than doubled its previous highest medal count with a tally of 143 medals. For the first time, four Cerebral Palsy athletes and one "Les Autres" athlete participated in the Games. Each won medals: Robert Walden (swimming) won four gold medals, Terry Biggs (table tennis) won a gold medal, Lyn Coleman (cycling) won silver medal and Malcom Chalmers (swimming) won a gold, silver and two bronze medals. Michael Milton at the 1988 Winter Paralympics. Australia sent five athletes; however, failed to medal. These athletes were Michael Collins, Kyrra Grunnsund, Evan Hodge, Michael Milton and David Munk, who all competed in both men's downhill, men's giant slalom and men's slalom, except Munk who only competed in the latter two events. Australia competed in 16 events, achieving 23 gold medals in three sports, Athletics, Swimming and Lawn Bowls. Overall, Australia received 95 medals, 23 gold, 34 silver and 38 bronze. Australia athletes broke eight records during the Games. Australia’s first ever gold medal at an Olympic or Paralympic Winter Games was won by Michael Milton when he won the LW2 Slalom event. There are no accurate results for the Australian Paralympic team performances at Winter Games previous to 1992; however, it is known that no-one medalled for Australia until the 1992 Paralympics. The Australian men’s swimming team was totally dominant in the pool, with Joseph Walker being the undoubted star winning nine gold medals (five individual, four relay) from nine events and setting two world records. Australia's most successful Winter Paralympic Games remain the 1994 Winter Paralympic Games, when five athletes took the podium on 9 different occasions. Australia was ranked 2nd in the final medal table with 106 overall medals; 42 gold; 37 silver; 27 bronze. This success has been attributed to the introduction of the Australian Paralympic Committee’s Paralympic Preparation Program. Australia’s team was half that of the host nation who lead the final medal table. In the Wheelchair Basketball match, Australia vs Great Britain, Troy Sachs recorded the highest number of individual points scored. 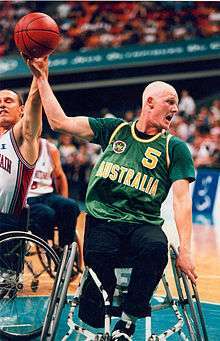 Sachs scored 42 points in a single game for Australia at the Atlanta 1996 Paralympic Games, which remains the highest ever individual score by a basketballer at the Paralympic Games. He is also Australia’s most awarded basketballer with two gold and one silver medal. At the Atlanta Summer Paralympics, there was the largest athletics away gold medal haul to date of 19 Gold medals. Australia collected two medals, one gold and one bronze, from the 1998 Games after sending four competitors. James Patterson competed in Alpine Skiing, winning gold in the men's downhill and bronze in men's slalom. The 2000 Sydney Summer Paralympic Games are Australia’s most successful Paralympic games to date. In the final medal tally, Australia was ranked first with 149 overall medals; 63 gold, 39 silver, and 47 bronze medals. Australia was represented by their largest team ever. The success of the team combined with extensive media coverage went a long way to changing public attitudes towards Paralympic athletes and understanding them as elite sportspeople. Australian values were represented well and truly throughout the Opening and Closing Ceremonies with a distinctly Aboriginal feel about the Opening ceremony and in true Australian tradition, a party atmosphere to the closing ceremony. At the Opening Ceremony, the Paralympic flame was lit by Louise Sauvage, one of Australia’s finest Paralympic athletes. Sauvage and Tim Sullivan both competed in this games and found outstanding success in their individual events. Sullivan is Australia’s most successful athletics athlete at a single Games, winning five gold medals in Sydney 2000. Australia’s best performance at Winter Paralympics winning six gold and one bronze medal at the 2002 Winter Paralympics. Of these medals, four were won by Michael Milton. Milton becoming the first athlete in his class to claim a clean sweep of gold medals across the four alpine disciplines when he won gold in all four of his events – Downhill, slalom, giant slalom, and super-G.
Paralympics Opening Ceremony in Athens at the 2004 Summer Paralympics. At the 2004 Paralympics, Australia was represented by a considerably smaller team than that of the 2000 Summer Paralympics in Sydney; however, ranked second overall medals behind China. The reduced team number was as a result of a strict selection criterium set by the APC and sports meant that only athletes with the potential to win a medal were on the Australian team. Australia took 10 athletes to compete in 3 sports and acquired a silver and a bronze medal to finish equal 13th on the overall medal table. Michael Milton won a silver medal in his event in his fifth and final Winter Paralympic Games, retiring as Australia's most successful Winter Paralympian ever. Emily Jansen competed, as Australia's first female competitor at a Winter Paralympics, in two of the four alpine events. Australia ranked fourth overall behind China, Great Britain, and USA in the gold medal table. The Beijing Games were the biggest ever with more athletes and countries competing across more sports than ever before. Australia sent their biggest delegation to an away Games to date with 167 athletes, 95 males and 72 females, who competed in 13 out of the 20 sports contested. Rowing was added to the Paralympic program with the Australian doubles crew winning silver. Timothy Sullivan became Australia’s leading gold medallist in Paralympic History, winning 10 gold medals. 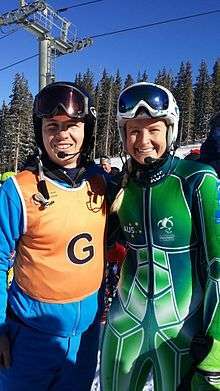 Australian Skier Jessica Gallagher (right) and guide Christian Geiger (left), 2014 Australian Paralympic Team Athlete. Australia took its largest team to date, of 14 athletes and their guides, to the 2010 Paralympic Winter Games. Despite the large team, Australia finished 16th on the overall medal tally, winning four medals. Australia had their first Australian female to win a medal at the Paralympic Winter Games, when Jessica Gallagher won bronze in the slalom. Australia finished fifth in the medal tally with 32 gold, 23 silver and 30 bronze medals, which medals that were won in nine of the 13 sports contested by Australian athletes. Australia achieved 16 world records and 35 Paralympic Records with performances from such athletes as: Todd Hodgetts (Shot Put), Kelly Cartwright (Long Jump), Susan Powell (Individual Pursuit), Bradley Mark (10m Air Rifle), Brenden Hall (400m Freestyle) and Blake Cochrane (100m Breaststroke). In total Australia had 93 medallists of which 25 were multi-medallists, while gold medallist there was 40 and eight of these were multi-gold medallists. London was the best performance by Australia’s Paralympic swim team since 1984. Men’s 4x100m Freestyle Relay swim team achieved Australia’s 1000th Summer Paralympic Games Medal (Australia’s 41st of the Games). Jacqueline Freney was the most successful athlete from any nation, winning eight gold medals from eight events while her swimming teammate Matthew Cowdrey became the most successful Australian Paralympian of all-time by winning his 13th career gold medal at his third Games. Matthew Cowdrey won gold on day seven in Men’s 50m Freestyle S9 Final, also breaking the world record which still stands at 25.13seconds. The victory gave Cowdrey (SA) his 13th career gold medal from three Games. The Australian wheelchair rugby team won its first Paralympic gold medal after claiming silver at the last two major tournaments (Beijing 2008, World Champs 2010). 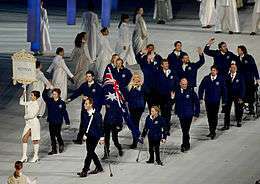 The Australian Team marches at the Opening Ceremony of the Sochi 2014 Paralympic Winter Games, led by flagbearer Cameron Rahles-Rahbula. The youngest competitor in the London Games, 13-year-old & 300 days Maddison Elliott from Newcastle, NSW, claimed one gold, one silver, and two bronze medals and had the pleasure of presenting Prince Harry with Australian’s Paralympian toy Mascot “Lizzie” the Frill-necked Lizard. Australia came away from these games with two medals, a disappointing result. Australian Paralympic Chief Executive Jason Hellwig said that 'we were absolutely disappointed we didn't get the mission done to win that gold medal', however, he also described it as the most satisfying he had experienced because of the hardship the team had gone through. The Australian Team's performance was greatly affected by their team member's death, Matthew Robinson, prior to the Games at the IPC Alpine Skiing World Cup. Katie Kelly & her guide Michellie Jones competing in Paratriathlon class PT4, PT2 e PT5, in Copacabana, Rio at the 2016 Summer Paralympics. The Australian team comprised 177 athletes of which 103 are men and 74 are women. Incredibly 89 athletes (50%) made their Paralympic debut in 2016. The average age of athletes on the Aussie team 2016 is 29.2 years. The average age of the male athletes is 29.1 years and the average age of female athletes is 29.4 years. Dylan Alcott competed in his third Paralympic games in two different sports, Wheelchair Basketball in 2008 and 2012 and Wheelchair Tennis. Alcott was successful in his transition from Wheelchair Basketball to Wheelchair Tennis, winning two gold medals in both the men’s quad wheelchair tennis doubles and singles. He became the fifth Australian Paralympian to win gold medals in two sports. Daniela Di Toro competed in her sixth Paralympics, having competed in Wheelchair Tennis from 1996 to 2012, winning Silver and Bronze medal each in 2000 and 2004 respectively. At the Rio Paralympics, Daniela competed in Table Tennis. Jessica Gallagher won Bronze in her fourth Paralympics in a third Paralympic sport, Cycling, after competing in Alpine Skiing (2010 and 2014 winning Bronze both times), and Athletics (2012). At 74 years of age, Libby Kosmala was the oldest athlete selected for the 2016 Summer Paralympics. The Rio Paralympics was Kosmala’s twelfth Games, having previously competed in Athletics, Swimming and Shooting at the Paralympic Games since 1972. Kosmala won 9 gold and 1 silver medals over that time. Claire McLean competed in Paratriathlon in Rio but had previously competed in cycling at the 2004 Athens Paralympics, placing silver. Kieran Modra won bronze in the men’s B road time trial in his eighth Paralympics, having competed in athletics in 1988, Swimming in 1992 (winning 2 Bronze), and Cycling from 1996 to 2016 (winning 5 Golds, and 2 silvers in that time). Previously, Liesl Tesch competed in Wheelchair Basketball from 1992-2008 (winning 2 Silver and 1 Bronze medals). In 2012 and 2016, Tesch transitioned to Sailing, winning a Gold medal each time. Amanda Reid medalled silver in cycling in Rio after previously swimming in London. 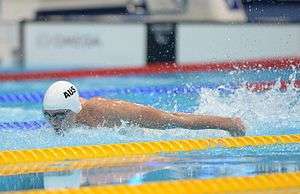 Australian Paralympic team member Brenden Hall at the 2012 Summer Paralympic Games in London. Australia won its first medal in archery since 1968, when Jonathon Milne won bronze in the men's archery individual compound W1. Paracanoe was debuted at the Rio 2016 Summer Paralympics and resulted in Curtis McGarth becoming Australia's first gold medallist in the sport. Paratriathlon also debuted, resulting in Katie Kelly and her guide Michellie Jones won the gold medal. Back-to-back winners of their events from the London 2012 Paralympic Games were: Ellie Cole (swimming), Brenden Hall (swimming), David Nicholas (cycling), Carol Cooke (cycling), Daniel Fitzgibbon / Liesl Tesch (sailing) and the Wheelchair Rugby Team. Jessica Gallagher (left) and Madison Janssen (right) prepare to to race in the Women’s B/VI 1000m time trial final in Rio at the 2016 Summer Paralympics. Ross Sutton won Australia's first gold medal at the Summer Paralympics in winning the Men's St Nicholas Round open archery at the 1960 Summer Paralympics. Daphne Ceeney was Australia's first female gold medallist at the Summer Paralympics. She won two gold medals in swimming events at the 1960 Summer Paralympics. 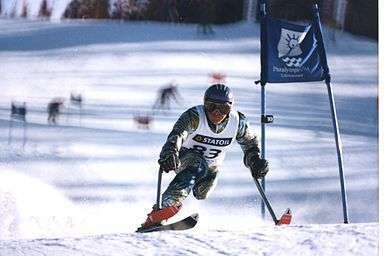 Michael Milton became Australia's first Winter Paralympics gold medallist in winning at the Men's Slalom LW2 at the 1992 Winter Paralympics. Jessica Gallagher - Winter 2010 and 2014 – bronze medals in alpine skiing; Summer 2016 – 1 bronze in cycling. At the end of the 2012 Summer Paralympics, the following Australian athletes have attended both Summer and Winter Games. ↑ "Olympic Games | Winter Summer Past and Future Olympics". www.olympic.org. Retrieved 2016-09-22. ↑ "Classification | Australian Paralympic Committee". www.paralympic.org.au. Retrieved 2016-09-22. ↑ "Mission & Goals | Australian Paralympic Committee". www.paralympic.org.au. Retrieved 2016-09-22. 1 2 3 4 5 6 Committee, Alexander Picolin, International Paralympic. "IPC Historical Results Archive - Australia at the Paralympic Games". db.ipc-services.org. Retrieved 2016-10-24. ↑ "Athletics at the Athens 2004 Paralympic Games Results: Athletics - Events and Medallists". IPC Historical Results Archive. 1 2 3 4 Picolin A, International Paralympic Committee. "IPC Historical Results Archive – Sydney 2000 Paralympic Games". db.ipc-services.org. Retrieved 2016-08-31. ↑ "Sydney 2000 Paralympic Games Results". IPC Historical Results Archive. ↑ "Australia Paralympic Games History". Archived from the original on 5 June 2011. Retrieved 23 April 2011. 1 2 3 4 5 6 7 8 9 10 11 12 13 14 15 16 17 18 19 20 21 22 Media Guide Rio 2016 Paralympic Games (PDF). Australian Paralympic Committee. 2016. pp. 17, 20, 22–24, 27–30, 37, 59, 94, 119. 1 2 3 4 5 Brittain, Ian (2014). From Stoke Mandeville to Sochi: A History of the Summer and Winter Paralympic Games. Champaign, Ill: Common Ground Publishing. pp. 96, 171, 186, 213, 215–222. ISBN 978-1-61229-412-4 – via EBSCOhost. ↑ "Participants Heidelberg 1972 Paralympic Games". International Paralympic Committee. ↑ "Elizabeth Kosmala | London 2012 - Official Australian Paralympic Team Website". london2012.paralympic.org.au. Retrieved 2016-10-26. ↑ "Ron Finneran interviewed by Mick Fogarty in the Australian Centre for Paralympic Studies oral histor... [nla.obj-219092551] | Digital Collection - National Library of Australia". nla.gov.au. Retrieved 2016-10-19. ↑ "Paralympic Results & Historical Records". www.paralympic.org. Retrieved 2016-10-19. ↑ International Paralympic Committee. 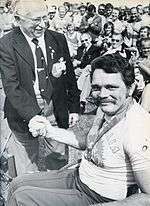 "IPC Historical Results Archive - Arnhem 1980 Paralympic Games". db.ipc-services.org. Retrieved 2016-10-26. 1 2 3 "2004 Australian Paralympic Committee Media guide : 2004 Athens [Summer Paralympics]" (PDF). ↑ "Australian Results at the 1976 Paralympics". International Paralympic Committee Results Database. ↑ Committee, Alexander Picolin, International Paralympic. "IPC Historical Results Archive - Web". db.ipc-services.org. Retrieved 2016-10-24. ↑ AUSTRALIAN TEAM Media Guide 2002 Salt Lake City Paralympic Games (PDF). Australian Paralympic Committee. 2002. p. 5. ↑ "2006 Australian Paralympic Committee Media guide : 2006 Torino Winter Paralympics" (PDF). ↑ McDonald, Margaret. "THE XI PARALYMPIC GAMES". Olympic Review. ↑ "Salt Lake City 2002 Paralympic Winter Games Results". International Paralympic Committee Historical Results Database. ↑ "2010 Australian Paralympic Committee Media guide : 2010 Vancouver [Winter Paralympics]" (PDF). ↑ "Jansen first Aussie woman at Paralympics". www.racingandsports.com.au. Retrieved 2016-10-24. ↑ "Australian Paralympic Committee Annual Report 2007-2008" (PDF). ↑ "2012 Australian Paralympic Committee Media guide : 2012 London [Summer] Paralympic Games" (PDF). 1 2 3 "2014 Australian Paralympic Committee Media guide : 2014 Sochi Winter Paralympic Games" (PDF). ↑ Paxinos, Stathi. "Sochi Winter Paralympics end in style". The Sydney Morning Herald. Retrieved 2016-10-24. ↑ "Australian Paralympian Matthew Robinson dies on way home from Spain World Cup". CourierMail. Retrieved 2016-10-24. 1 2 3 4 5 6 7 8 "Rio Paralympic Games 2016: Ultimate guide, fun facts". Retrieved 2016-10-03. ↑ "Dylan Alcott: Rare Australian record of gold in two sports". The Roar. 2016-09-16. Retrieved 2016-10-24. ↑ "Oldest Rio Paralympian ready to bring home gold". 2016-06-05. Retrieved 2016-10-03. 1 2 3 "That's a wrap: Australia at the Rio Paralympics". The Roar. 2016-09-20. Retrieved 2016-10-24. ↑ Spits, Scott (19 September 2016). "Rio Paralympics 2016: Australia's Steelers record double overtime victory over United States to win gold medal". Sydney Morning Herald. Retrieved 21 September 2016. ↑ "Media Guide : London 2012 Paralympic Games" (PDF). Australian Paralympic Committee Website. Australian Paralympic Committee. Retrieved 30 August 2012. 1 2 "First Australian Paralympic medals go on display". Australian Paralympic Committee News, 25 March 2013. Retrieved 13 October 2014. 1 2 "One leg, two dreams". Australian. 10 February 2007. Retrieved 23 January 2013.